This former Primitive Methodist chapel is now represented by a plaque on a garden wall, commemorating its former existence. 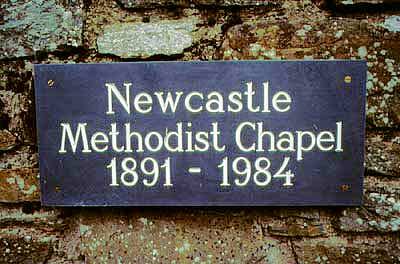 After meeting in Newcastle since the 1840s, the congregation built a chapel in 1891 after they were presented with a piece of land by Miss Clements of Clun on 30 June 1891. The foundation stones were laid on Wednesday 9th September 1891, and the chapel cost about £220 to build. The builders were Mr K. Jordan and Mr R. Francis of Ford Street. The chapel closed in 1984 and the building was sold.